An artistic rendition shows the notional robotic servicer's (right) rendezvous. A notional customer is shown (left). Next step: docking and refueling. If space robots ever perform satellite repairs or fix up a base on the far side of the moon, their human operators will need long-distance vision and a delicate touch despite sitting thousands of miles away on Earth. Now there's a possible solution: a medical console used in robotic surgeries has helped control a NASA robot from afar. Sending a robot would save astronauts from having to undergo costly, dangerous missions to fix or refuel satellites, space stations or distant planetary outposts — even if NASA shuttle crews ventured out on risky repairs of the Hubble Space Telescope in the past. Having the ability to repair or top off the tanks of satellites could also save millions or billions of dollars by extending their useful mission lifetimes, rather than scrapping the satellites as space junk. "We're using the expertise we’ve developed in medical robotics technology and applying it to some of the remote-controlled tasks that NASA wants space robots to perform in repairing and refueling satellites," said Louis Whitcomb, a mechanical engineer at Johns Hopkins University. Whitcomb oversaw the recent robot demonstration at NASA's Goddard Space Flight Center in Greenbelt, Md. NASA Goddard is home to NASA's Satellite Servicing Capabilities Office, where the U.S. space agency considers new ways to fix satellites and set up space gas stations. The industrial robot at NASA Goddard was controlled by two Johns Hopkins graduate students — Jonathan Bohren and Tian Xia — who sat at the Johns Hopkins Homewood campus in Baltimore 30 miles away. They saw the robot's location through the 3D eyepiece of a modified da Vinci console, which usually helps surgeons do robotic surgery on cancer and heart disease patients. "We already have a lot of computer-assisted surgical technology here at Johns Hopkins," Xia said. "We could use some of it to help fix and refuel satellites." The console's haptics technology also gave the robot operators a sense of "touch" feedback through vibrations, so that they could better control a robot's hands, claws or other grippers. Both humans and robots will need all the coordination they can get to face their next long-distance challenge. The Johns Hopkins team is working with West Virginia University on a new demonstration to show how a robot could snip the plastic tape holding a satellite's thermal insulation blanket in place. 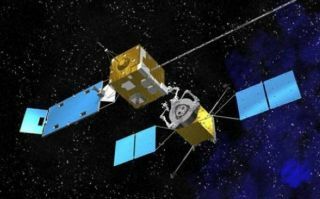 The robot would then pull back the blanket to reveal the satellite's refueling port. Another challenge comes from longer-distance repair missions. A repair job in orbit around the moon would mean a longer delay in command signals sent from human operators on Earth to a space robot. But the Johns Hopkins team, led by computer scientist Peter Kazanzides, has begun developing a way to compensate for the delay.